Happy weekend, Wrimos! Now’s our chance to either catch up or to surge ahead. I had two writing sessions tonight in my effort to get my word count back where it should be, a longer one before and quick one after the administration of fluids to my elderly kitty. Ah the joys of a fur baby! Motivation: Catching up to that pesky number in the square marked “14” on my NaNoWriMo word count calendar. It’s been taunting me all day at work and into tonight from its place as my desktop wallpaper. Inspiration: Discovering I’d written myself into a great spot to introduce another of my secondary characters. She’s going to factor into things later on, and so far, I’m not sure who’s side she’s on, her own or my characters’. Biggest Triumph: Keeping going although I really wanted to watch the movie that came in the mail from Netflix. Biggest Setback: Getting a late-ish start on writing because I took advantage of the sale at Old Navy. Seriously though, is that a setback or another triumph? Ha. Have a great weekend, all, wherever you are and whatever you’re doing, even if it’s not sitting at home with fingers flying across a keyboard. Hello from the trenches! It’s been a good night in NaNoLand at my house. I introduced my main characters – and future lovers – to each other by way of a pass-by on horseback while he was looking quite splendid in his knightly finery. I followed through on the great idea I had earlier today when I was…occupado on how to bring in my heroine’s ex-husband earlier in the story and establish him as one of the antagonists. Not to mention the whole session went much better because all I had playing in the background was my COC playlist. I also had excellent motivation to write tonight because waiting for me when I got done was my brand-new Blu-ray of “Maleficent” that just came out today. Yes, I know I’ve seen it three times already, but it’s that good. How Long I Wrote Today: 3.5 hours or so. Feeling: Thrilled, but that’s tempered by a slightly sore back from sitting crooked on the couch while writing. Inspiration: Adding a new soundtrack to my playlist, and staying ahead of the word count, knowing I might not get to write tomorrow. Biggest Triumph: Keeping on writing when I could have stopped so that I finished up Scene 5 and can start fresh on my next session. Thus I shut the door on November 4th. Tomorrow choir starts up again so you might not hear from me if I’m too pooped to write when I get home at 9:30. In the meantime, keep on writing, my Wrimos! 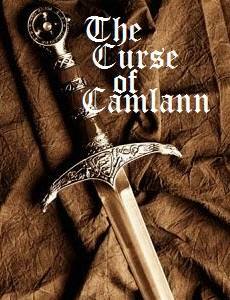 As I sat with my fellow NaNo prepper M yesterday in our usual Sunday library corner, I managed to get all of the plot for “Curse of Camlann” I’d already sketched out officially written down. I also downgraded one character to a supporting role and introduced a newer one, based on my musings and input from Mom, because one should always listen to Mom. Furthermore, I renamed Obsessed Ex-Husband because his name was too soap opera-y and found his photo on Pinterest, posting the latter to my COC board for future reference. Fortunately, only that last one was an official distraction, unless one counts the chips, sour straws and Reese’s that M tossed onto the table oh so cavalierly. 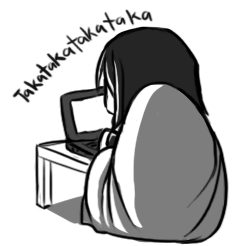 Anyway, as I was saying… My plan for Sunday was to get farther along with the rest of the plot. As in all the way done. M had to keep reminding me anything done is better than nothing done at all. So I kept plugging along. Occasionally I’ d ask her random questions on random topics, checked with her writer brain that works differently than mine to see if an idea I had made sense or was completely off the mark, or if one scenario would be more appropriate than another. For example, after one exchange, M had this opinion: it might be a little bit scary for Reese (immortal hero of the story), who has just resurrected from being shot by the Obsessed Ex-Husband of Rowena (heroine of the story) and whom she thinks is dead because moments before Reese had no pulse, to touch her on the leg where she kneels within reach next to him to let her know he is not in fact dead after all. Smart woman, that BFF of mine. Well, it’s halfway through October and I am well trenched into that time-honored activity called NaNo Prep. As my previous post explained, I am totally a planner, so it’s not unusual to find me working on characters, plots and all the other things I can do early before writing begins on November 1. The last couple of Sunday writing sessions have been abbreviated due to things like M taking her oldest to a birthday party and me singing during two services at church. For me, that means not so much productivity on the things that I should be working on. Instead, I’m doing things like updating my NaNoWriMo dashboard with all the new details — click here to visit my author dashboard and see what I’m up to — and creating a book cover for that very same page. I find it fascinating how long it can take to crop an image, add some text, rotate it this way and that in order to get it to look the way you want just so you have an image for the site instead of a sad blank square. Now, I think it’s time to get back to plotting. I’ve got a lot of story to figure out, not to mention the mechanics of my character’s immortality. Hmm. 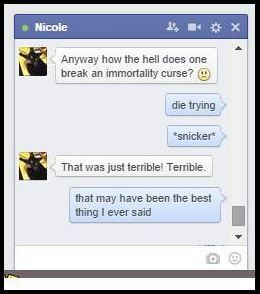 Mechanics of Immortality. If my current book title doesn’t work, that definitely sounds like a winner. 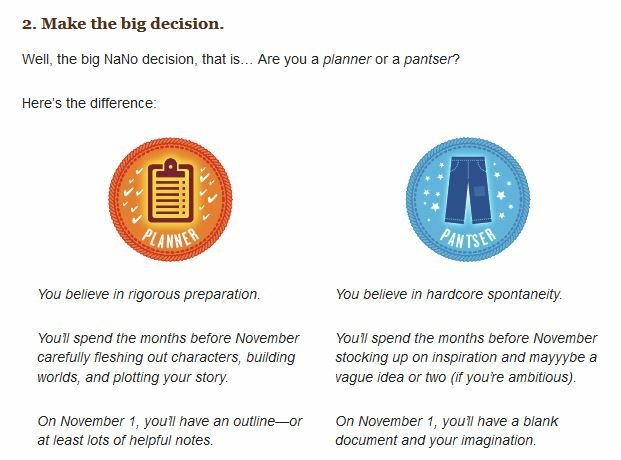 NaNo Prep: Panster or Planner? Hello! I know I’ve been quiet lately on the writing front, and NaNo is to blame. Instead of working on flash fiction, I’ve been solidly prepping my NaNo novel. Yes, I am fully aware that November is still over a month and a half away, but this is me were talking about. Interestingly, in my email this morning, I find NaNoMail on this very subject. Figuring the Fates are giving me a poke, I thought I’d check it out. Yes, I most definitely groaned when I read her “helpful” suggestion, and called her on it later, but yeah, it was pretty funny. Fortunately, I’ve since worked out how to break Reese’s curse. Now I’m working on Rowena’s ancestral family tree to see how many times in the last 1500 years the curse could have been broken but was thwarted by one thing or another. Note: for more information on this year’s NaNo novel, check out the sidebar under “NNWM 2014 Project” (click the three horizontal lines to access). It’s a couple of days late, but here’s the result of my flash fiction challenge that M issued last week. In case you missed the earlier post on this, you can read it here but I’ll also make it easier by reminding you below. It was a good exercise for me in many ways. First, I’m writing! That’s always a good thing. Second, it was good for me to start and end a story in 2,000 words, because it showed me I could actually finish a story, not just a scene like I had with the writer’s blocks.As I mentioned in my Meet My Character Blog Tour post, once I got the bare bones of this story down on paper and knew who my superhero heronie was, it turns out the story came together pretty quickly. I spent a few hours on Saturday writing 75% of the story, and the rest on Sunday with M at our monthly writing session. I also have to thank the Syfy Channel’s 2007 mini-series “Tin Man” and the character of Azkadellia for inspiring the way that Skylar reveals her wings. So, there may yet be hope that I’ll finish either “GBE” (that’s my chick lit “Great Boyfriend Experiment” novel in progress for those of you new to the blog that’s 85% done and really, really long) or “Shifters” (my paranormal/fantasy novel that I started during NaNoWriMo 2013) in the near future. For now, I’ll settle for presenting to you Skylar’s story. Skylar pushed through the revolving door of her office building and emerged into the humid afternoon rolling her shoulders, trying to relieve some of the stress from her day’s work as a courier. She’d been busy since she’d arrived that morning, from the first assignment a few blocks over in the city to the last that had taken her two territories over. Her shoulders ached, but that was no surprise, considering the flight time she’d clocked that day. Glancing up at the Corporate cameras on every corner of every block aimed in every direction, she weighed calling out her wings to relieve some of the aches against how long it might take the Central Database to register she wasn’t on the clock and report her.She settled for pulling out her cell phone and making an appointment for a massage. Sighing, Skylar headed for home with her her hands shoved into the pockets of her short jacket so the cameras wouldn’t pick up on her frustration. She could have tolerated the constant surveillance and the Corporation controlling all aspects of her life if she at least liked her job. There weren’t that many options for her kind, although she’d never wished to be anything other than what she was, even if it meant being stuck for life in a job she hated. Still, she didn’t want anything to affect her standing in the SARC waiting list. That’s what she really wanted to do, like her uncle had done before her. He’d told her stories of his adventures with the Search and Rescue Corps until the day he’d been caught in an explosion and lost the use of his wings. She’d interned with SARC all through college, hoping she’d get a placement on graduation. Unfortunately, no positions had been available and she’d been stuck looking elsewhere. Skylar knew it could be worse. She could be in a job that didn’t allow her to use her wings at all, forced to keep them hidden except for that single hour a day alloted for exercise to keep the muscles from atrophying. Her mother had freaked out when she’d hit puberty and the grayscale tattoos had appeared on her shoulders, shoulder blades, upper arms and ribs, indicating she’d inherited her father’s power of flight. Skylar had been thrilled and had reveled in the freedom to use them whenever she wanted. Even when she’d come of age at twenty-one and received her implant, she hadn’t minded her appointment as a courier because it meant she’d get to fly every day. Ten years later, it was a different story. She turned the corner toward home when the streets behind her suddenly erupted in shouting and screaming. Spinning around, she caught sight of a large group of fliers heading for the city in tight formation. She watched as they reached downtown, paused long enough to make one big circuit in the air, then gained a few hundred feet in altitude before flying hard and fast downward. It wasn’t until she saw them tuck in their wings that she knew their intent. Even as she thought it, the dozen men and women in the sky broke apart and aimed for the small cluster of six buildings that comprised Corporation headquarters. She flinched as she watched them intentionally crash through windows, targeting four separate floors in each of three main buildings. Glass rained down on the citizens below, most being able to duck under awnings or into doorways to avoid the shards. Suddenly, the air went still and the sounds of the street went quiet, as if the city itself were holding its breath in anticipation. A second later, all three damaged buildings exploded from the inside out, cascading chunks of concrete and steel into the neighboring buildings and onto the streets and people below. Skylar shoved her way through the crowd running away from the buildings now billowing thick black smoke and engulfed in flames, trying to make her way closer to the scene of the attack. She could hear the sirens that heralded the coming of the nearest SARC team off in the distance, but they were a lot farther away than they needed to be in order to be of any significant help. Based on where the bombers had chosen to target each of the buildings, she knew it was only a matter of time before one or all three of them began collapsing. Suddenly she felt the unmistakable downdrafts of a winged flier and looked up. Two airborne members of the elite SARC team had arrived, and they hovered in the air, assessing the situation. They shouted for everyone to get back, to go home, to get inside, but Skylar didn’t want to be anywhere else. Here were her uncle’s stories unfolding before her in real life, in real time, in all of its horrible glory. She could easily see her uncle hovering aloft in a blue and gold uniform calming everyone down with firm but gentle authority, creating order out of chaos, and helping anyone who needed him. Her appointment forgotten, Skylar smiled and stepped back until she was mostly hidden in the doorway of a nearby shop to watch. The roaring of the fire didn’t bother her, nor did the ash that was beginning to fall from the burning buildings, or the chaos caused by frightened citizens. This was what she wanted, not schlepping papers or currency or this bit of whatever from city to city for whoever could pay for the privilege. This was what she was meant to do with her life, she was sure of it. It took a moment for her to realize something wasn’t right. Without the rest of their SARC team, the fliers weren’t able to do anything about the raging fires so they still burned out of control. Without their equipment or support personnel, they were only able to rescue or assist a limited number of people in the air or on the ground, and she could see their frustration in the way they flew. She heard shouting and saw quite a few curious people had come out into the streets, thinking the worst was over. The fliers were urgently ordering them back inside and off the streets before putting on a sudden burst of power and rocketing up higher in the sky. Seconds later, she understood why. They’d seen from their higher vantage point what was coming next and were getting out of the way so they’d be around to help. Loud cracking and popping preceded ominous rumbling that shook the ground Skylar stood on as each of the four damaged floors in the first building imploded and it began to collapse. Skylar gripped the edge of the doorway and buried her head in her shoulder to muffle her crying as she imagined all of the people who were trapped within that two hundred story building as it fell, unable to do anything but die. Her head snapped up as she heard horrified screaming, and Skylar barely contained her own scream as she saw that workers within the buildings had started breaking windows and leaping out into thin air rather than being caught and crushed as the building went down. The SARC fliers reacted immediately. They literally swooped in and snatched people out of mid-air, but they were too few and the jumpers were too many. For every four people they caught and rescued, twice that many plummeted to the ground. Only a few were lucky and managed to land on a succession of awnings or trees that slowed their descent enough to keep them alive, but most ended up broken and bloodied on the pavement. When she heard the popping and booming starting again, Skylar turned away, not wanting to watch the second building and its tenants fall to their doom. It was then she heard her uncle’s voice in her head, saw him centered in the midst of an emergency helping anyone that needed him even after he’d been grounded. She knew then what she wanted to, could do. Yet she also knew the price she would have to pay. If it meant she saved just one life, it would be worth it. Shoving out of her hiding place, Skylar headed for the chaos, shedding her jacket as she ran. Her tattoos shimmered on the bare skin revealed by the halter top she always wore as she twisted up her hair and secured it with the tie that was ever-present around her wrist. One of the fliers saw her as he deposited a man and a woman on a fire escape, and hollered at her to get back and out of the way. Rather than replying, she stopped abruptly in the middle of the street and called forth her wings. Closing her eyes, she took a deep breath. 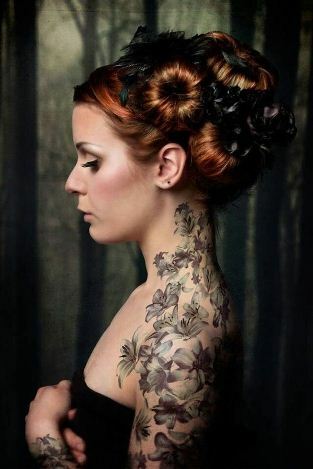 As her arms lifted, she willed her wings to emerge from her tattoos. She heard gasps from those around her as the stylized wings seemed to lift from her skin, growing and unfolding in an impressive display. The glossy dark gray and black feathers caught small slivers of sunlight that made it through the floating ash as she stretched them to their full ten-foot wingspan. Wasting no time, she vaulted into the air. She pumped her wings hard and reached the same altitude as the other fliers, communicating with the hand signals she’d learned during her internship. Relief flashed briefly across their faces as they welcomed the help before they directed her beneath them. Ripping the nearest canvas awning off the building, she held one end and threw the other out, and each of the fliers caught hold, creating a makeshift sling that could carry multiple people to safety. Just as they dropped off their first load onto a nearby fire escape out of danger, a sharp burst of pain skittered up the full length of her spine to her brain. Her unsanctioned activity had been transmitted to the Central Corporate Database through her implant and logged, and the noncompliance command had been triggered. Simultaneously, the Corporate warning all citizens feared echoed through her mind. Citizen. You are acting outside of contract parameters and are hereby ordered to cease and desist. Comply immediately for summary judgment or endure summary execution. Without hesitation, Skylar made her choice and remained aloft with the other fliers. But with every minute that passed, the pain coursing through her body from her implant intensified, and it began to affect her ability to fly. She waved off the concerned looks of the SARC team and kept going until she couldn’t hold back her cries. “You’re not SARC, are you?” the nearest flier guessed. The rest of the SARC team arrived just in time as the third building collapsed and the pain became too much for her. Skylar struggled to stay aloft and barely kept her side of the sling in the air until the six men and women within leapt to safety. Her grip slipped, then her left wing faltered, and abruptly she plummeted. The closest SARC flier released the tarp and dove after her, barely catching her in time to settle her gently on the street. Fighting the pain, she managed to whisper, “Because for me, there was no other choice.” With a sharp, piercing scream, Skylar convulsed as her implant transmitted its final fatal pulse. As she went limp in his arms, the young flier lowered his head to rest it against hers. He jolted as someone touched his shoulder, and he looked up to see the last six people she had saved standing in a circle around them. He nodded once to each of them, then launched himself into the air. Author’s Note: You know it’s good when it makes both you and your best friend emotional at the end of the story. So thanks, Meagan, for challenging me to write my first ever finished short story. Go me!